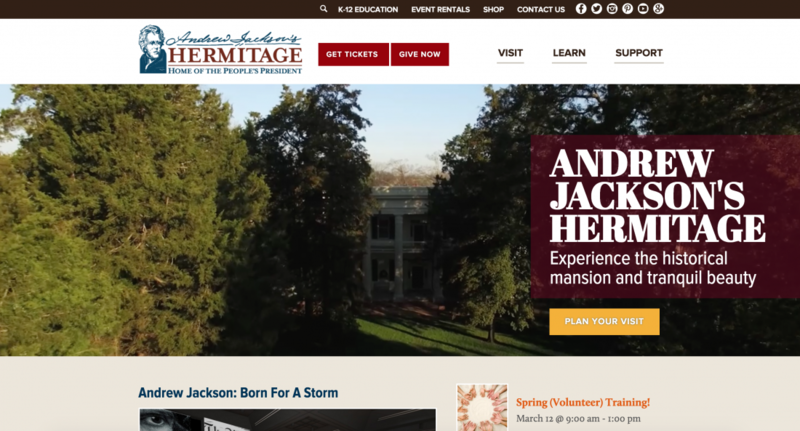 With a new $1.1 million exhibit preparing to open and a visual rebranding underway, Andrew Jackson’s Hermitage recruited Landslide Creative to upgrade and revamp their online presence to propel Andrew Jackson into the digital age. Andrew Jackson’s Hermitage — historic home and 1,120-acre plantation of the former president in Nashville, TN — has welcomed over 15 million visitors from across the globe. 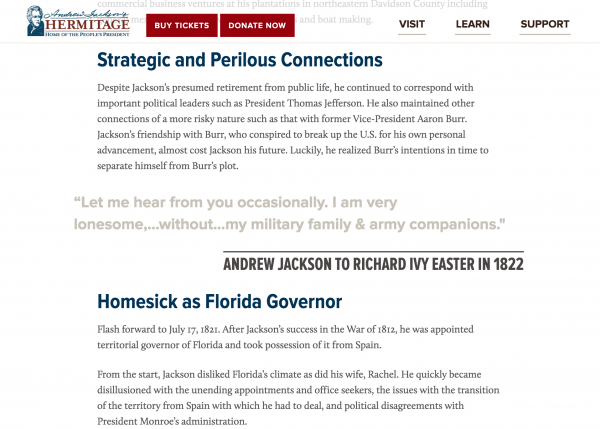 Through careful preservation and educational as well as entertaining programming, The Hermitage’s goal is to preserve a pivotal period in American history while educating the public about the fascinating, and often controversial, life of Andrew Jackson. Because the new exhibit was launching in a few short months, there would be quite a bit of attention on The Hermitage locally and industry-wide. Additionally, a revamped logo and visual brand were nearly complete. It was imperative that the online identity be overhauled to match this new brand and handle the upcoming traffic. Increasing online ticket sales and streamlining the purchase process was one of the most important objectives. That meant it needed to be simple and intuitive for users to plan their visit. A key goal for the site was to streamline the navigation for both users and admin. By analyzing past visitor behavior, we determined the sections that should be in the primary navigation. 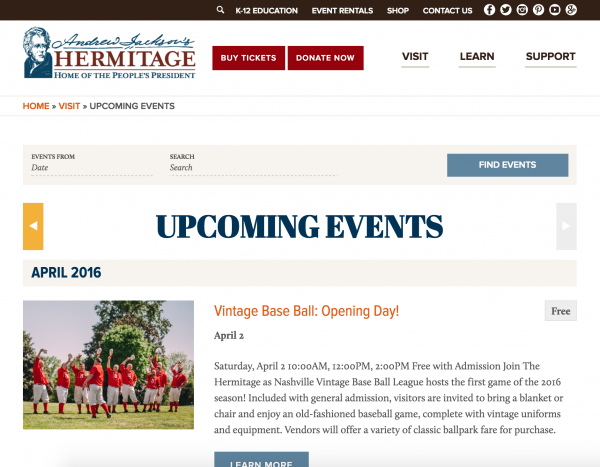 Buy Tickets and Donate, the two most important calls to action, were given prominence in the header on every page. 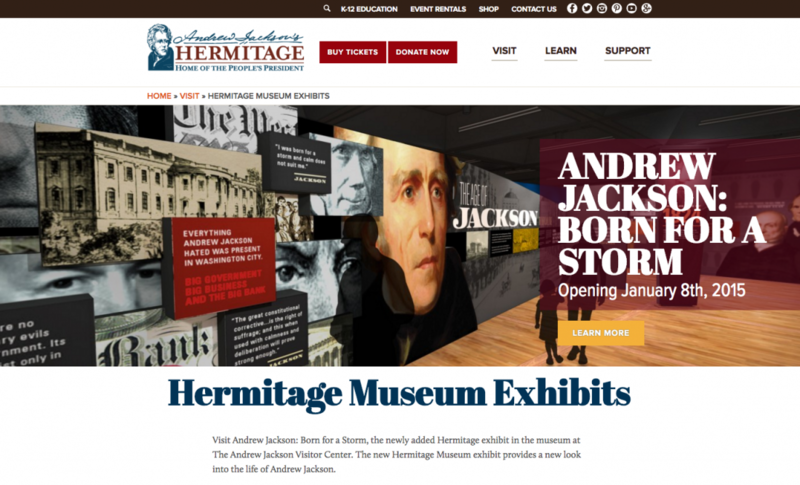 The Hermitage’s new, state-of-the-art exhibit, Andrew Jackson: Born for a Storm, was the inspiration for the overall website design, and a key feature of the website. The Hermitage has an enormous collection of modern and historic photos. They were added to the page layouts liberally to better showcase the property and collections. Website administrators can select a variety of page layout templates to accommodate different sizes and orientations. We integrated a calendar solution that allows administrators to manage events, including creating recurring events and attach ticket sales to events. The footer was expanded to feature information that was most useful to prospective visitors: the hours, address/map and contact information. The fully expanded navigation is also in the footer for at-a-glance navigating. The Hermitage is considered by many historians to be the most well-preserved early presidential home, and it sits on a sprawling farm complete with beautiful gardens and secluded hiking trails. 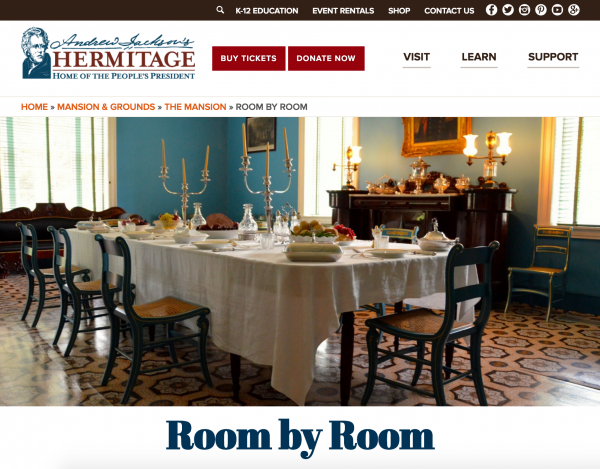 The Hermitage agreed that the quality of the online experience did not accurately reflect the quality of the in-person experience. 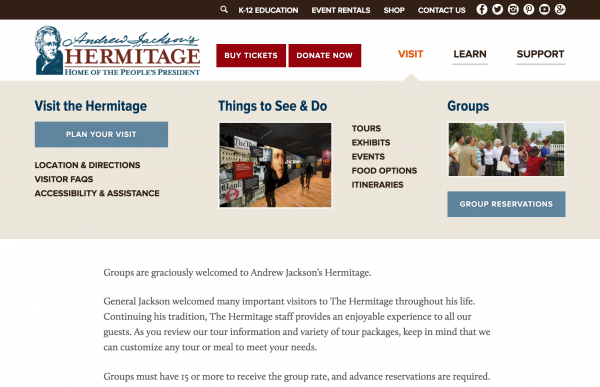 The Hermitage’s previous website did not reflect their engaging in-person experience. The site used a variety of third-party tools that made website management difficult for administrators. The site also had limited flexibility, preventing admin from easily updating information or adding content. This difficulty contributed to the site becoming disjointed and disorganized, compromising the experience for both users and admin. One of the most significant issues was the lack of mobile functionality. With mobile usage growing steadily, it was imperative that the site be responsive. Search engine performance and social engagement were also areas for improvement. We kicked things off with a strategy session where continued to to develop our understanding and define the needs and goals of the project. We met with all project stakeholders, including the president, chief curator, marketing team and each department director, to continue to develop our understanding and define the needs of the project. What did each department need from the website? What did internal users like and dislike about the current website? How did users interact with the website? The process also included created user profiles, outlining prototypical website users. 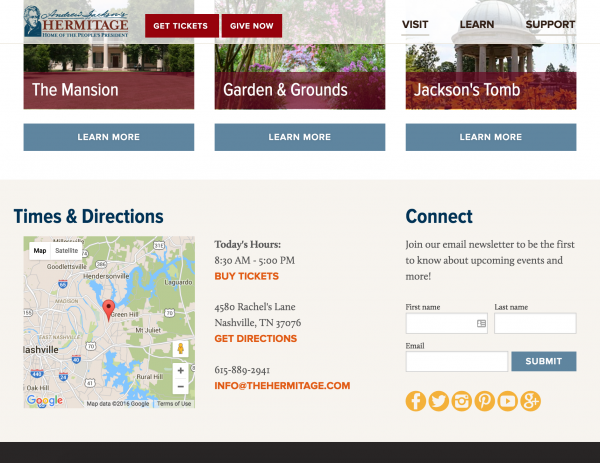 Thoughtful, intuitive information design was critical for a site as complex as thehermitage.com. The existing site was a labyrinth of links that often required users to browse multiple locations to find the information they needed. The navigation had to become more intuitive, especially now that mobile accessibility was a requirement. A map illustrating the current organization highlighted areas of possible confusion and duplicate content. Next, we put every, and we do mean EVERY, piece of content on its own index card. This allowed us to arrange and rearrange until every element had a logical home. Our goal was to get the navigation to fit in as few primary “buckets” as possible to require a limited number of clicks when searching for information. Additionally, limited primary links simplify navigation for the mobile experience. We settled on Visit, Learn and Support. We converted our working model into a digestible, visual site map that we refined with The Hermitage team, and then used to guide the design and development. Then, using the site map as our guide, we created wireframes — “skeletons” of individual pages that shows how content will be arranged on the page. We began the design phase with a “style tile” — a board that previewed all of the design elements, from typefaces and colors to textures and photo treatments. Adding this step ensures that there are no surprises, and fewer revisions, when the individual page layouts are created. With the information architecture and design finalized, development began. The site was developed on WordPress for a number of reasons, including its ease of use for administrators, excellent search engine optimization capabilities, and scalability. When we begin the development process, we like to start with a solid infrastructure. To do this, we’ve developed our own theme boilerplate. It uses a combination of existing open-source tools (HTML5 Blank, Foundation) and new features we’ve written ourselves. Think of it as blank slate that encourages writing elegant code. Our boilerplate does one other key thing: promotes a mobile-first approach to front-end development. 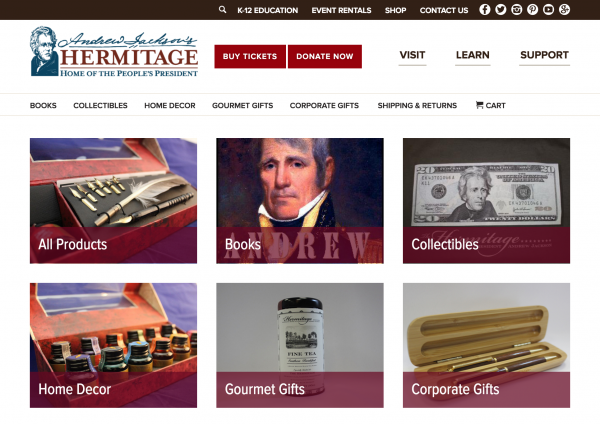 We knew that the existing Hermitage website was discouraging people from viewing it on mobile devices, so we committed to creating a mobile user experience that equaled, or in some cases exceeded, the desktop version. The only way to achieve this consistent experience was through responsive web design. That means we wrote a single codebase that looks great and loads quickly no matter what size screen is being used. 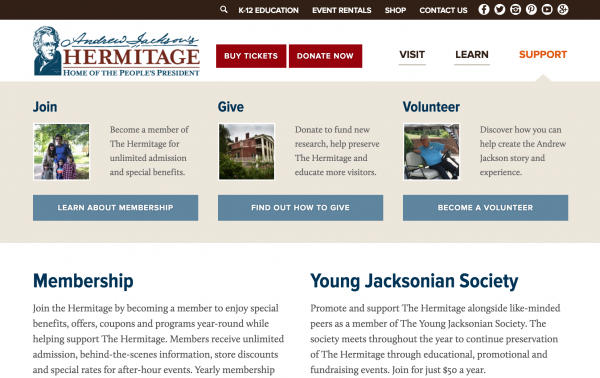 For the Hermitage, they only have to enter and maintain content in one place. 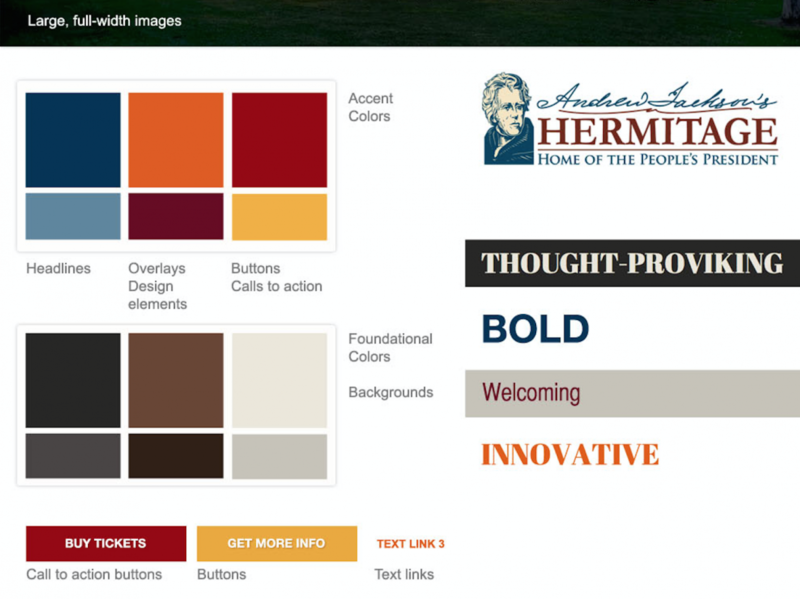 By leveraging custom post types, custom fields, automatic image resizing and shortcodes in WordPress, we gave the Hermitage complete control of their content without the worry that they would break the design. The front-end code knows what content to take from where and how to make it look great for the user’s device. Throughout the entire process, our strategy was to design for skimmers, swimmers and divers. Common in the museum industry, this approach means providing options for users based on how deeply they are willing to engage with your material. Working closely with internal stakeholders, we wrote new content and tweaked existing content, in an effort to make it easily digestible and optimized for search engines. Shorter sentences and paragraphs, pull quotes and arresting headlines were suggested, and targeted keywords were infused into copy. We developed an online store for the Hermitage within WordPress and trained their store employees to use it to monitor and fulfill orders. Within the first couple of months after launch, the Hermitage had already experienced an increase in online orders. The site reached its goal of 50,000 sessions per month. The site originally saw about 90,000 pageviews each month. After the redesign, the site averages over 126,000 pageviews each month, a 40% increase. After a month of the site being live, sales from the online store were 200% above average. This project with the Hermitage presented many challenges: a large, complex site map, a variety of target audiences, conflicting internal needs and requests, and significant goals. 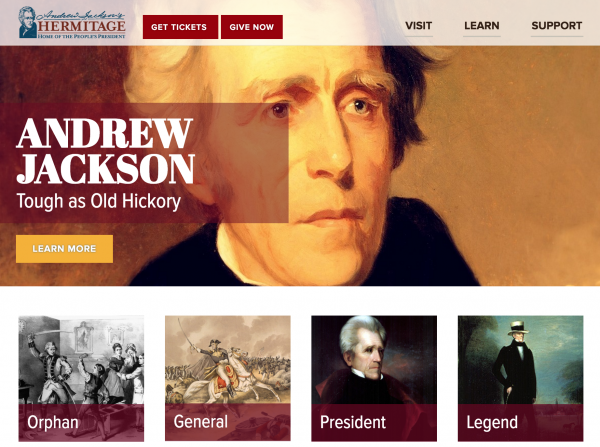 Despite these challenges, Landslide Creative and The Hermitage leadership and marketing teams were determined to create a final product that would capture and share Andrew Jackson’s vibrant personality and substantial contribution to our nation’s history. 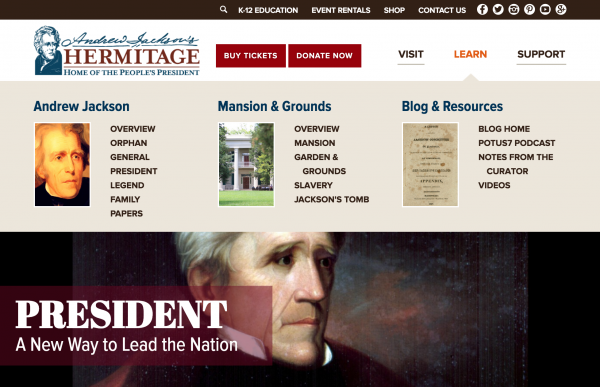 Experience the website we created for Andrew Jackson’s Hermitage yourself at thehermitage.com. Want to know more about this project or talk about how we can partner on your website redesign or marketing project? Get in touch at info@landslidecreative.com.